2002 Western Conference Semifinals Game 4, May 12, 2002 | Highlights from a crucial game 4 between the Lakers and Spurs featuring the Spurs giving up a double-digit 4th quarter lead and Kobe winning the game on a put-back layup. Kobe finished the game with 28 points, 7 rebounds and 3 assists while Shaq totaled 22-11-5. On the other side, Tim Duncan put up 30 points, 11 rebounds, 6 assists, and 4 blocks for the Spurs. Kobe Bryant & Shaquille O'Neal Full Highlights vs ... Kobe Bryant Full Highlights vs Sacramento Kings 2001 WCSF ... Views : 4671. Kobe Bryant Top 5 Plays on Tim Duncan. Kobe Bryant Top 5 Plays on Tim Duncan. 14:59. 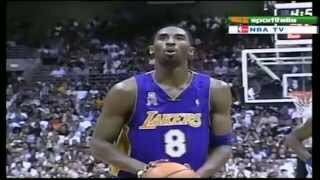 ... Shaquille O'Neal &Kobe Bryant Full Highlights vs Minnesota Timberwolves 2003 WCR1 GM4.